Update 2: Microsoft is now rolling out Windows 10 insider preview build 14931 for fast ring insiders. The company did not release mobile build due to some issues. Insider team has fixed the issue causing people to experience a black screen when signing out and switching to another user account and unable to log into that account. An issue regarding the built-in Windows 10 apps such as Calculator, Alarms & Clock, and Voice Recorder to not work after updating to a new build is now fixed with build 14931. Oracle VM VirtualBox will crash on launch after upgrading to build 14931. Optional components may not work after upgrading to build 14931. To get it working again, go to “Turn Windows features on or off”, scroll down and check the right optional component and click ok. After a reboot, the optional component will be enabled again. Build 14931 has some issues for keyboard users, using tab to navigate the Settings app. The arrow keys should work as a temporary workaround. Update: Microsoft is preparing to release Windows 10 Redstone 2 build 14931 and Mobile build 10.0.14931.1000 for insiders soon. Original Story: Microsoft Windows insider team is now testing Windows 10 PC build 14931 and mobile build 10.0.14931.1000 internally. 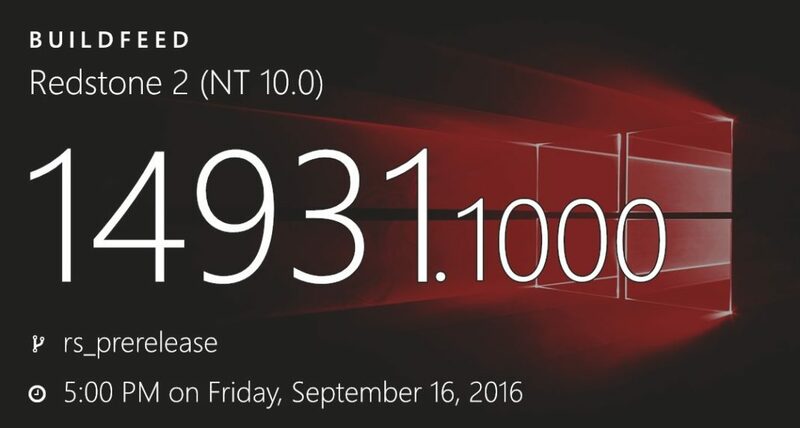 The latest internal build is compiled on September 16, 2016.